Wrestling is widely recognised as the oldest competitive sport in the world. Cave drawings have been found from the Sumero-Akkadian civilisation depicting wrestlers from 3000BC and similar wall paintings from ancient Egyptian civilisations date from 2400BC. Much later, the Greeks introduced wrestling to the ancient Olympics in 708BC. Greco-Roman wrestling, deemed a pure reincarnation of ancient Greek and Roman wrestling, was a key part of the first modern Olympics in Athens in 1896. In this form, wrestlers can use only their arms and upper bodies to attack and can hold only those same parts of their opponents. A second style of wrestling, known commonly as 'catch as catch can', had by then become a popular professional entertainment in Britain and the USA, and in 1904 was introduced to the Olympics under the guise of freestyle wrestling. 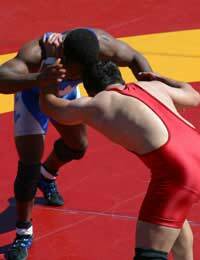 These wrestlers can use their legs for tripping, lifting and pushing and can hold opponents above or below the waist. There are 18 events in Olympic wrestling. Men contest Greco-Roman and freestyle wrestling in seven bodyweight categories: under 55 kilograms, 55-60kg, 60-66kg, 66-74kg, 74-84kg, 84-96kg and 96-120kg. Women's freestyle wrestling was introduced in 2004 and there are four bodyweight categories: under 48kg, 48-55kg, 55-63kg and 63-72kg. Hundreds of styles of wrestling exist worldwide. Many nations have indigenous forms, among them Cumberland wrestling in Britain, Glíma wrestling in Iceland and Schwingen wrestling in Switzerland. Four main forms of amateur competitive wrestling are practised internationally: Greco-Roman, freestyle, judo and sombo. Judo is a separate sport at the Olympics, while sombo, a combination of freestyle and judo, is most popular in the republics of the former Soviet Union and has not featured at the Games. Russia is one of the strongest nations in both Greco-Roman and freestyle wrestling and finished top of the medal table in Athens, winning five men's gold medals - three more than nearest rival Uzbekistan. Siberian-born Aleksandr Karelin was one of Russia's leading performers between 1988 and 2000. A super heavyweight Greco-Roman wrestler, Karelin made his Olympic debut in Seoul and comfortably defeated his first four opponents. He trailed Bulgarian Rangel Gerovski 3-0 in the final with only 30 seconds left, but used a reverse body lift to score a five-point takedown and won gold. Karelin was undefeated between then and the Barcelona Olympics, and eased his way to a second gold medal, with only one of his opponents lasting until the time limit. In Atlanta, Karelin became the first wrestler to win the same weight division three times and outscored his five opponents 25-0 in the process. The one blemish on his Olympic career came in the final of the Sydney Games in 2000, when a rare lapse of concentration cost him his 13-year unbeaten record. Karelin lost 1-0 to the USA's Rulon Gardner and had to settle for silver. In 2001, Karelin, who also won nine world championships, received the Olympic Order, the highest award of the Olympic Movement, from the then president of the International Olympic Committee Juan Antonio Samaranch.